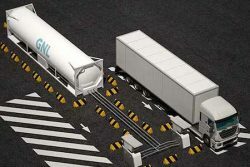 Cryostar, supplier of cryogenic equipment for Liquefied Natural Gas (LNG) fueling stations, has celebrated the launch of its new FUELNG-Deploy concept. With a storage LNG capacity of up to 40 m3 the FUELNG-Deploy relocatable vehicle fueling station is a cost-effective solution ideal for serving a small number of vehicles (up to 75 refueling per day). 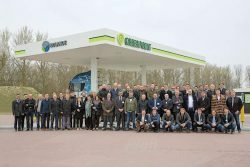 The event was celebrated at the LNG fuelling station of Rolande LNG, in Oude Tonge in South Holland where the station commenced operations in November 2018. The LNG and CNG station is the second to come from a collaboration between Rolande LNG and Van Kessel Olie from Milheeze, is jointly operated by both Brabant companies and is part of the Greenpoint multi-fuel gas station of Van Kessel Olie. Over 70 customers from all over Europe and Russia attended the inauguration of Cryostar’s first unit of our new FUELNG-Deploy concept on March 21. It is a compact, modular and transportable LNG fuelling station, materialising Cryostar’s latest technological advances in the area of LNG-fuelling of road tractors and natural gas for mobility. Designed and developed to provide an optimal solution for our gas customers or transporters wanting to distribute their liquefied natural gas, the FUELNG-Deploy station guarantees flexible use and deployment of the station while providing the same filling experience as a fixed Cryostar station. Due to its modularity, compactness and small footprint, the modular station is the ideal solution for companies wanting to enter this field or develop their business in it. Combining rapidity and low implementation costs, it is supplied as a turnkey solution and can either be installed alongside an existing standard station or used to equip a new site. With over 110 fixed LNG fuelling stations installed throughout the world, Cryostar is happy to support its customers in developing the field of Natural Gas for Vehicles.